After toiling hard to create and put together some quality content on your website, you’d certainly want to maximize viewership of that content. One quick, effective way to raise awareness and spread the word about it to your audience is to share it on Social Media. “Create Once, Publish Everywhere” is the mantra practiced by many Content Strategists in order to get the message across the most number of eyeballs. In this post, I’ll share with you just that…some basic yet often overlooked tips that website owners can implement in order to make sharing of website content such as blogs & articles, much more effective and easy on Social Media. If you are one of those who’s already been convinced of the advantages of Content Marketing, you’d agree that these advantages can only be realized and capitalized upon, if the Content can be propagated to a sizeable audience. Social Media gives an ideal opportunity to do this. Your Social Media presence and Website strategy works hand in hand, each feeding the other in more than 1 way. Your Social Media Business/Company Page brings traffic to your Website for further engagement and conversion, whereas your Website can enable the visitors who have found you (by other means) to easily share what they have learnt and feel about your product or service. How to set up Social Sharing Buttons? If your website is done using a CMS such as WordPress then there are ample of Plugins (free and paid) available to install this functionality. These plugins feature buttons for all major Social Networking sites ranging from Facebook to Pinterest. Here’s a comprehensive post about the popular Social Sharing Plugins that’ll help you decide which one to go for. There are similar metadata elements available for other Social Media e.g. Twitter Cards for Twitter. How to incorporate Open Graph? Again, if your site runs on WordPress CMS, there’s the official Facebook plugin that allows you to enable the Open Graph metadata, alternatively if you are using the highly popular WordPress SEO by Yoast plugin then this functionality already comes included. Your Web Page URLs may often be super long and unwieldy, especially if they happen to reside lower in the hierarchy of your Site architecture. Pasting such long URL’s in a Facebook post maybe a big turn-off for users, not to mention the interference they’d bring in the limited size copy that you’d want to concisely pitch. With shortened links you can help shrink a long URL into a few characters, these can then be easily accommodated in your post. Where to get Shortened Links? 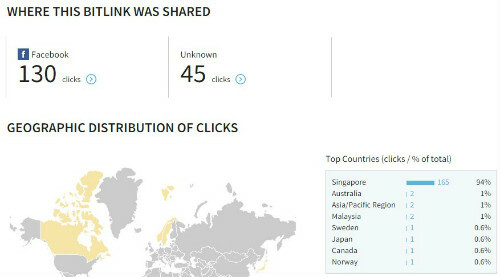 Use a link shortening service such as Bitly, this not only gives a condensed link but also provides useful statistics on how many times the link was clicked and from where it was clicked! Always add Social Media Icons on your website that link to your company’s social media account. These icons could be placed in the Top Bar, Footer or in Sidebar Widgets of your site. How to add Social Icons/Links? Nowadays, this feature is quite fundamental and would certainly have been included as part of your website template or theme. If not, search and upload a good set of icons freely available and link them to your Social Media Business Pages. You can show snippets of your Social Media activity right within your website. To do this, include the Facebook Like Box by embedding it as a widget in your website Footer or Sidebar. The Like Box can be configured to show faces of your existing fans and also a stream of your most recent Facebook Page posts. The advantage of having a Like Box is that your website visitor can become a Fan of your Business page without having to leave your site. Secondly, if someone is viewing this Like Box on your site and one of their friends has also liked the Facebook page, then he or she will see their friend’s face in the box. This provides a tremendous impetus for a visitor to like and further engage with your website or Fan page. How to Add a Like Box? Facebook offers a customized Code (for your Facebook Page) that can be obtained from Facebook’s Like Box Plugin page. The 2 part code can be included in your website pages at a place where you want to display the Fan Box. Alternatively, the official Facebook Plugin for WordPress can also deliver the desired functionality. Don’t let your Website Content go unnoticed the next time you publish a Blog post or an interesting graphic, let it have the attention it deserves. Integrating your Website with your Social Media presence and vice versa not only brings about greater engagement but also helps facilitates your message to reach out. Sharing is Caring, make the most out of it!